Just one hour’s drive North of Perth, Moore River in Guilderton is the perfect stand up paddle boarding destination offering unspoilt rural and coastal landscapes and breathtaking views. It’s the perfect getaway for a group or go solo if you need a quick trip to disconnect from the artificial world for a while. It’s an amazing place. Where the river mouth meets the Indian Ocean separated by a sandbar that breaks occasionally creating a pretty awesome scene as water surges in and out with significant force. Most of the time however, it’s calm and tranquil. There are heaps of “off the beaten track” things to do in the region including 4 wheel driving, fishing, bird-watching, walking trails and of course supping so you can easily make a weekend of it or if time is short its easily doable in a day. This isn’t luxury, it’s basic and unspoilt which makes it all the more special. On this trip we stopped in at the Verge 301 Café for lunch which is a few km’s before you get to the Moore River Estuary. Really cute little place and the coffee’s not bad. It’s from here that we headed to the Boat Ramp off Barragoon Road which is where you can drop in for a 6.5km paddle downstream all the way to into the Moore River Estuary. Check out the you tube videos of some of our day trips and better still jump in the car without too much thought and create your own experience. There are three places to launch your board that I’m aware of. The boat ramp jetty in the Moore River Estuary although this is not easy if you struggle with balance. You can walk your board down the slope at the left hand side of the boat ramp, just be wary of the rocks. Silver Creek Reserve (off Silver Creek Road). This is a quiet spot where you can escape the crowds and drop in here. The park has toilets and basic picnic facilities. Barragoon Road Boat Ramp. (turn into King Drive then Link Road). Very basic and a bit muddy but part of the appeal. This is where you would drop in if you wanted to head one way down stream and enjoy a 6.5km paddle to the river mouth. If you’re doing a return trip it’s best to paddle from here in the morning and back in the afternoon with sea breeze behind you which is very doable. There are plenty of holiday houses for rent and a Caravan Park right on the Estuary but you will need to book well in advance during the school holidays and festive holiday season. This truly is a special place and simplicity is the key to appreciating its beauty. 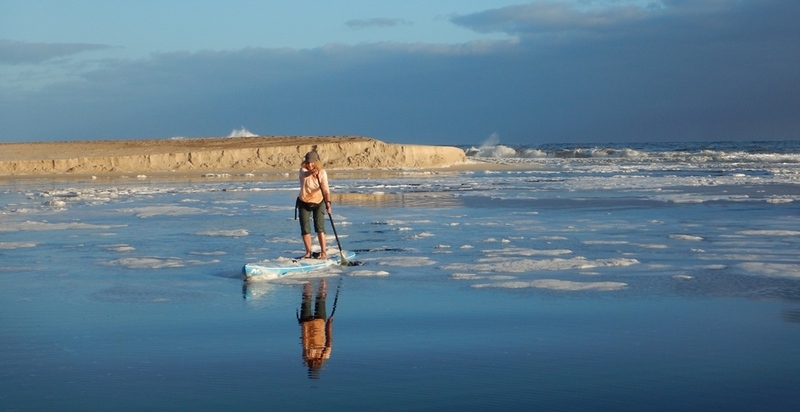 So leave the makeup and heels at home, chuck on the SUP and take a break with nature.